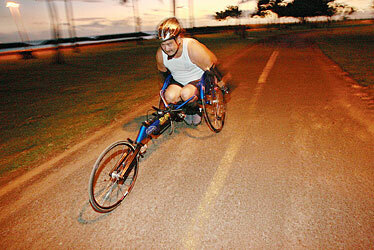 Mike Nishimoto trains on his hand cycle at Magic Island. Nishimoto suffered from severe spinal injuries from a bus accident in 2003 and was told he would never walk again. With the support of his friends, he was back competing in marathons and triathlons in two years' time. Nishimoto will compete in tomorrow's Great Aloha Run. To many participants, like Mike Nishimoto of Hawaii Kai, winning the Hawaiian Telcom Great Aloha Run tomorrow isn't the goal. It's finishing that makes them winners. "Just getting across the finish line ... I accomplished a goal," said Nishimoto, who will be entering in the wheelchair division for the second time. It will be his 10th Aloha Run, which this year boasts some 21,000 entrants in the 24th annual event. The 8.15-mile race, which starts in downtown Honolulu and ends at Aloha Stadium, benefits Carole Kai Charities. Five years ago a bus smashed into Nishimoto and severed his spinal cord as he was training for a triathlon. But his friends wouldn't allow him to spend the rest of his life as a couch potato after his surgeon told him he'd never walk again, that he would be dependent on someone to care for him around the clock. "It was my friends who dragged me out of the house, dragged me out to the beach ... (and) out of depression," Nishimoto said. These 10 to 15 friends were the guys he trained with, and if they hadn't pushed him toward recovery, "I know exactly where I would be; I'd be home, a couch potato. My life would be over," he said. "Step by step, through the whole thing, they never left me. They stayed with me (and helped him gain independence). I can't tell you how much this has meant to me," added Nishimoto in tears. In his first comeback to the Aloha Run three years ago following the accident, he tried to walk it with a cane, but "it was the most painful experience I ever had." A retired Navy information systems technician, Nishimoto has to take narcotics to control the effects of nerve damage he will never be rid of, and "training takes my mind off the pain." Nishimoto has regained "almost normal" use of his right leg, and about 60 percent of his left leg. "I can walk for a block or two, but I cannot run. The jarring hurts my lower back (and) left knee," he added, so he uses a wheelchair in the race. He completed the Honolulu Marathon last year, even though he had to stop and change a flat tire, and he is training for a triathlon. His arms do most of the work while swimming, and his right leg does all the pedaling when he bikes. He also takes part in wheelchair tennis, basketball and other sports. "Without the races it would be hard for me to get up and do anything. It's a reason to get out of the house; it's social. If I didn't have it, I don't know what I would do," he said. Nishimoto was living a sedentary, humdrum existence when he first entered the Aloha Run in 1997 to start a more healthy lifestyle. "Ever since then I was hooked," he recalled. "I had such a great time. I was so happy I did it, and I couldn't believe I did it." Getting injured "opened up a whole new world for me" in working out with others in wheelchairs, and realizing "you can do anything you want." He wants to show disabled people that life can be enjoyed to its fullest: "If I can do it, you guys can do it," Nishimoto said. » Who: Entrants include the Sounds of Freedom, a military group running in formation while chanting. » Related event: Sports, Health & Fitness Expo at the Blaisdell Center Exhibition Hall, through today. For schedule of workshops, demonstrations, and games, visit www.great aloharun.com or www.hawaiiantel.com, or call 528-7392.